Steamers are a versatile part of most professional kitchens. They’re versatile in a couple of different ways. The first is that operators can cook a variety of product in a variety of ways in one steamer. The second is that there are a variety of steamers on the market. Before an operator chooses his or her steamer, it’s important to identify the type of cooking the steamer will be used for and then which steamer is appropriate. Fortunately, Groen offers a unit for the different steamer applications. Cooking in steamers can be categorized into four different ways. The first is batch or production cooking. In batch cooking the operator fills the steam cavity with product and allows the cook cycle to run its course without the introduction of new product in the cavity. This sort of cooking is popular in grade schools and other similar applications where large volumes of rethermed food are produced on a short timeline and served in bulk. Groen’s Intek, Smartsteam100 or Hypersteam steamers all excel at batch cooking. The second type of cooking is à la carte or cook-to-order. The name is pretty self-explanatory, but this cooking demands that the steamer is capable of taking on new product in the steam cavity as needed. Applications where à la carte steaming is most necessary often include high-end restaurants that prepare each dish as it’s ordered. This cooking style requires the ability to interrupt the steamer’s cooking cycle and to add and subtract food from the steam cavity with little to no recovery time. 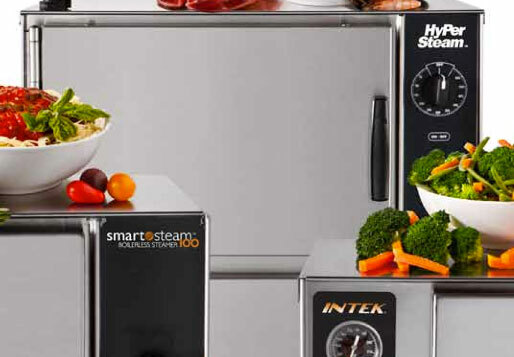 For à la carte cooking, Groen recommends its Smartsteam100 or Hyplus steamers. Retherm is the next type of food preparation capability in steamers. Retherming is the process of bringing refrigerated or frozen pre-cooked product back to serving temperature. This sort of preparation work is common in Italian restaurants that might prepare full pans of lasagna each night for service in individual portions the following day. To retherm food, The Intek and Smartsteam100 from Groen are best. Operations that need the ability to cook in any combination of the previously mentioned methods are said to cook in the versatile style. Operators should consider the Smartsteam100 or Hypersteam from Groen for their versatile cooking.